A former member of Velasco Robbery Hold-up group died in anti-illegal drugs entrapment operation in Labo, Camarines Norte. A bloody end for a suspected Daet, Camarines Norte drug pusher. 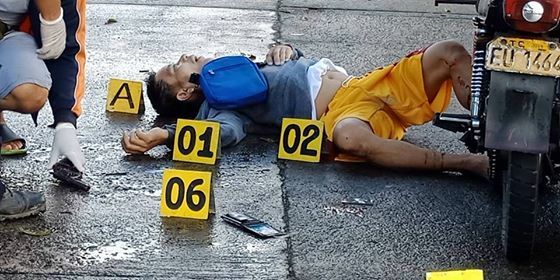 The bloodied body of Joel Panotes lies flat on the road of Purok 4, Barangay Guinacutan, Labo Camarines Norte after he was shot by police operatives, Photo by Labo Municipal Police. Legazpi City, [11.29.18] – Another anti-illegal drug operation in Camarines Norte was concluded in a bloody neutralization of a suspected drug pusher, a police report reaching Camp BGen. Simeon A. Ola said. According to Police Chief Inspector Maria Luisa C. Calubaquib, Police Regional Office 5 Spokesperson a police operation through buy-bust was conducted at 5:55 o’ clock this morning. The operatives of Labo Municipal Police Station and Regional Police Drug Enforcement Unit/Regional Intelligence Division, Police Intelligence Branch 2nd Camarines Norte Police Mobile Force Company conducted a buy-bust operation. The operation for a violation of Republic Act 9165 at Purok 4, Barangay Guinacutan, Labo Camarines Norte against Joel Panotes of legal age, single, a resident of Sitio Mandoloongan, Barangay Gubat, Daet, Camarines Norte. During the conduct of the buy-bust the suspect tried to evade apprehension pulled-out a caliber .38 and shot the police officer who acted as a police poseur-buyer during the buy-bust, the report said. He sustained several gunshot wounds and he died on the spot, the report ended. I will relay your concern to the PRO-5 Spokesperson soon as she arrives from her official travel.